eCite - Fluid compliance among patients having haemodialysis: can an educational program make a difference? Fluid compliance among patients having haemodialysis: can an educational program make a difference? Title. Fluid compliance among patients having haemodialysis: can an educational programme make a difference? Aim. 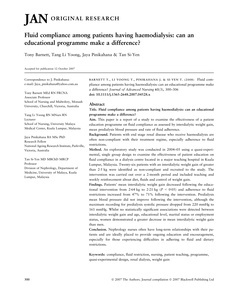 This paper is a report of a study to examine the effectiveness of a patient education programme on fluid compliance as assessed by interdialytic weight gain, mean predialysis blood pressure and rate of fluid adherence. Background. Patients with end stage renal disease who receive haemodialysis are often non-compliant with their treatment regime, especially adherence to fluid restrictions. Method. An exploratory study was conducted in 2004� using a quasi-experimental, single group design to examine the effectiveness of patient education on fluid compliance in a dialysis centre located in a major teaching hospital in Kuala Lumpur, Malaysia. Twenty-six patients with an interdialytic weight gain of greater than 2�kg were identified as non-compliant and recruited to the study. The intervention was carried out over a 2-month period and included teaching and weekly reinforcement about diet, fluids and control of weight gain. Findings. Patients� mean interdialytic weight gain decreased following the educational intervention from 2� kg to 2� kg (P < 0�) and adherence to fluid restrictions increased from 47% to 71% following the intervention. Predialysis mean blood pressure did not improve following the intervention, although the maximum recording for predialysis systolic pressure dropped from 220 mmHg to 161 mmHg. Whilst no statistically significant associations were detected between interdialytic weight gain and age, educational level, marital status or employment status, women demonstrated a greater decrease in mean interdialytic weight gain than men. Conclusion. Nephrology nurses often have long-term relationships with their patients and are ideally placed to provide ongoing education and encouragement, especially for those experiencing difficulties in adhering to fluid and dietary restrictions.